Offering a rural environment in Hickman County, Tennessee yet accessible to a hospital, airport, schools and golf. With over 700 acres, this property offers mini farms of all sizes from 10 to 50 acres for sale, or lots can be combined for large acre farms. All lots have woods as well as pasture land with beautiful house sites; many offer land with spring water or land with ponds. 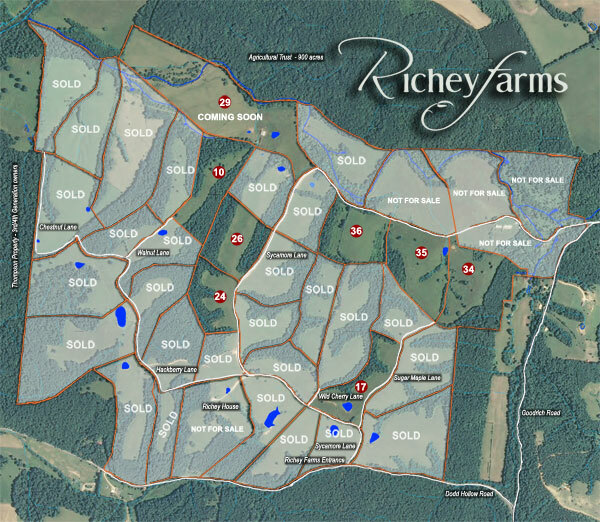 Richey Farms is protected on the north by a farm trust of just under 1,000 acres and on the south by Dodd Hollow Rd. With covenants prohibiting mobile/modular homes and setting standards for your neighbors, all can enjoy the good life. City water and electricity will be provided to each lot. Boundary lines for the lots are based upon an aerial survey; therefore, exact boundaries may be altered prior to sale. These alterations may increase or decrease a home site's acreage in accordance with developer designs. All boundaries and exact acreage will be surveyed prior to any sale.